Glasgow Punter: 75 Years Ago. The Sinking of HMS Glorious. My granny celebrated her 90th birthday just before Christmas there. When she was 6 years old her mother died at the age of 34. 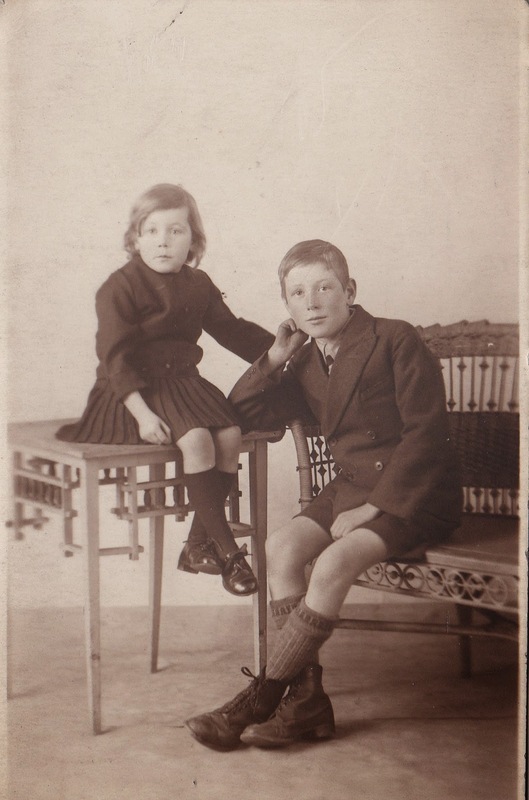 In June 1940 she was 15 years old when her only brother died at sea. His name was Rodger Donald Bailey, although she called him Donald. He served in the Royal Marines and was one of the 1,207 men who lost their lives on board the HMS Glorious when she was sunk on the 8th of June 1940 by the German battleships Scharnhorst and Gneisenau. 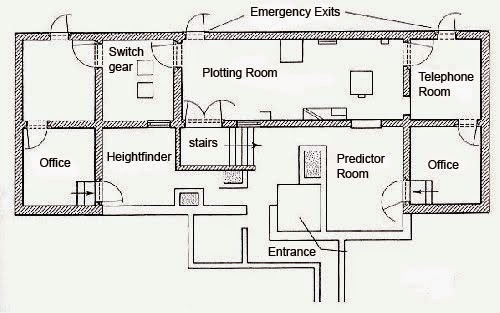 The Royal Navy knew nothing about the sinking until it was announced on German radio and some confusion still surrounds the details of the events that day. HMS Glorious was lost 75 years ago this year. In the same encounter the two destroyers escorting her, Acasta and Ardent, were also sunk and 1,519 British seamen died. 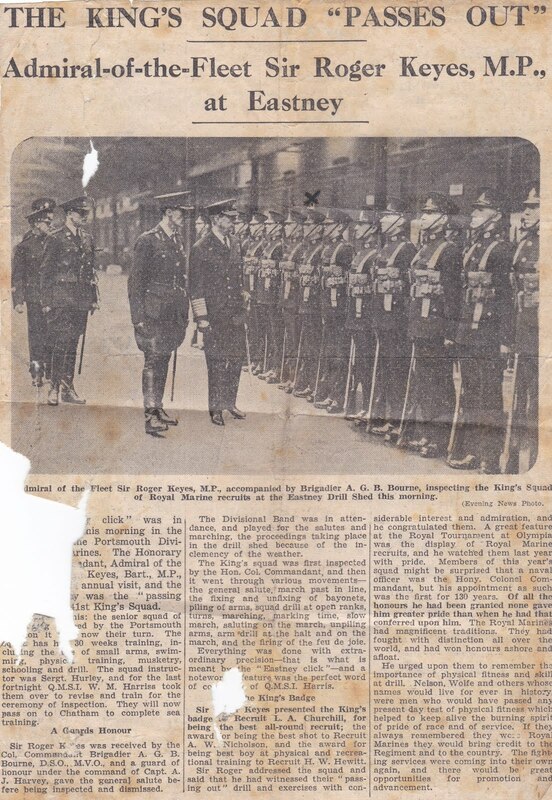 Although it is now 75 years since Donald and his companions died, my gran remembers her brother fondly and I recently had the chance to look through some papers she has held onto. 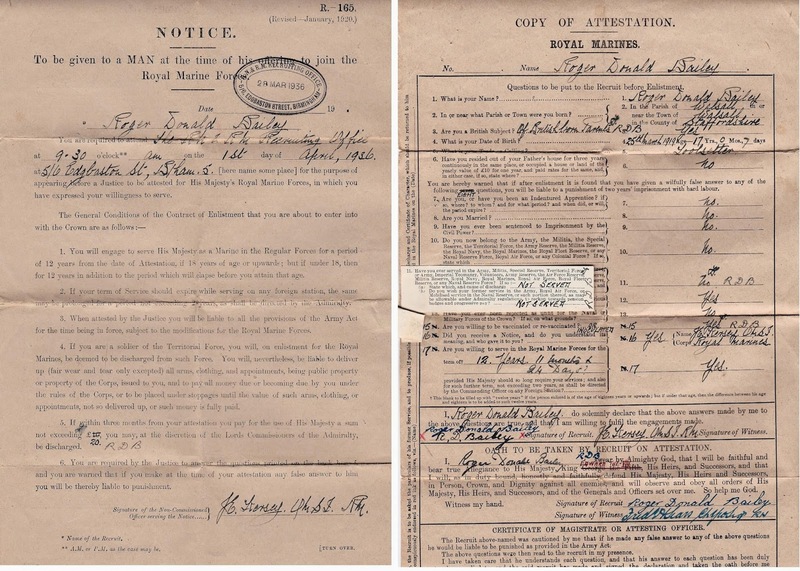 These show the confusion after the sinking, with false rumours coming to the family that Donald may have been a prisoner of war until finally, over a year after the sinking, his death was confirmed. 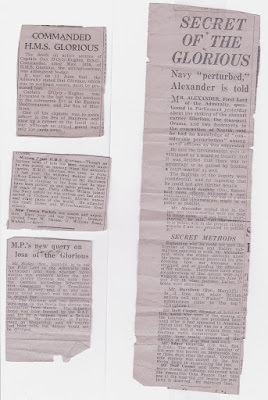 The letters from the Admiralty would also have been sent to many other families so I have copied them here in full to allow anyone else interested in these events to see what happened. 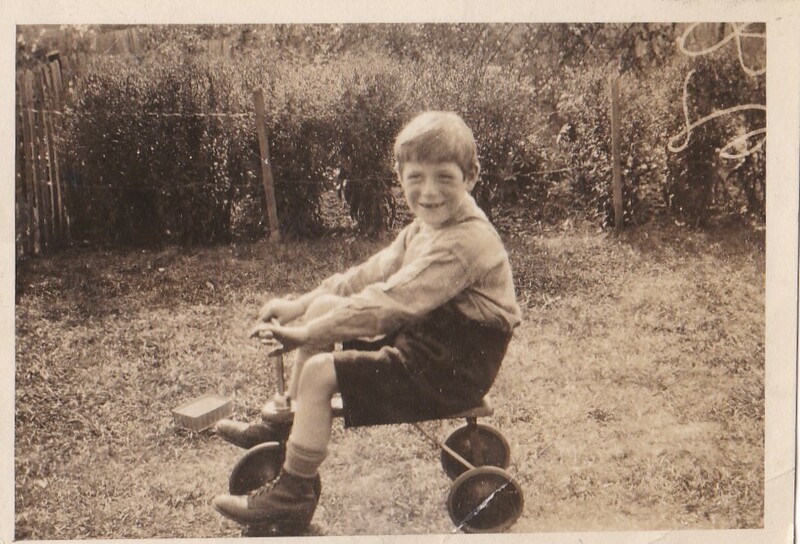 So on this anniversary of his death I'm looking back on his short life, my gran's big brother. 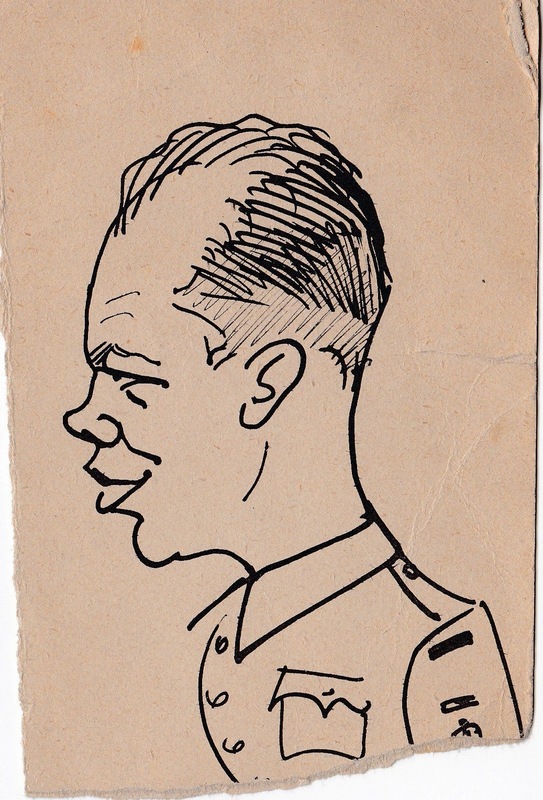 Rodger Donald Bailey was born the 25th of March 1919. 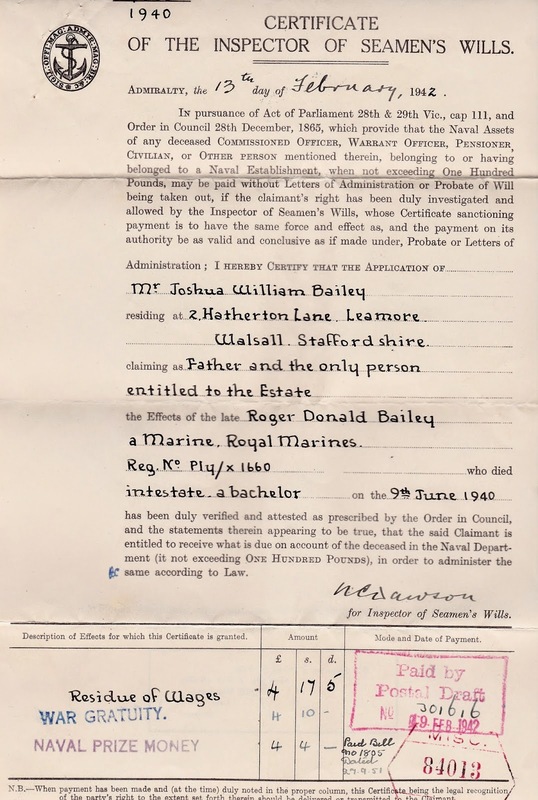 His father, my great-grandfather Joshua Bailey, was a blacksmith, originally from Wednesbury, in the heart of the Black Country, where his father had been a bootmaker. Joshua and his family moved to Walsall where my granny and her only brother grew up. who was six years older than her. 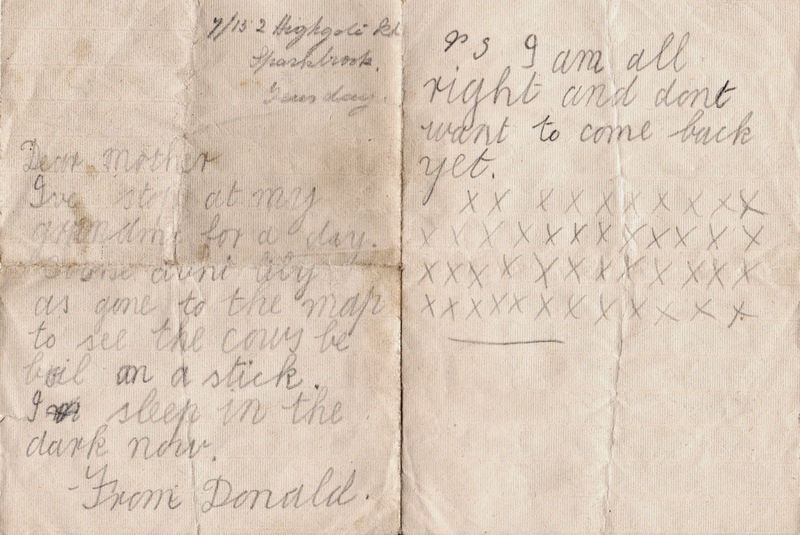 In this note a young Donald has written back home to his mum from a trip to see his grandmother. He tells her that he sleeps in the dark now, and does that say Aunt Lily has gone to the map to see the cows be boiled on a stick? Maybe not. 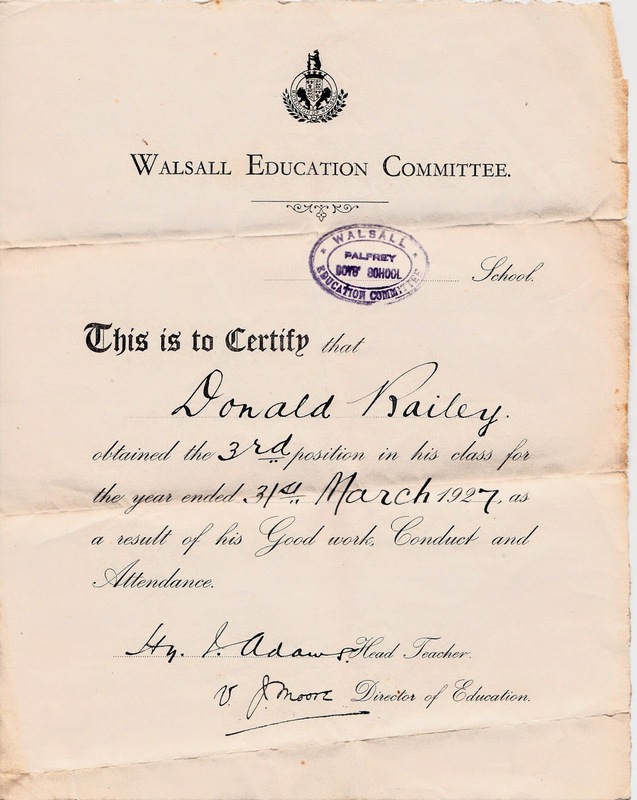 In 1927, aged 8 he is attending Palfrey Boys School in Walsall and acheives third place that year in the class. 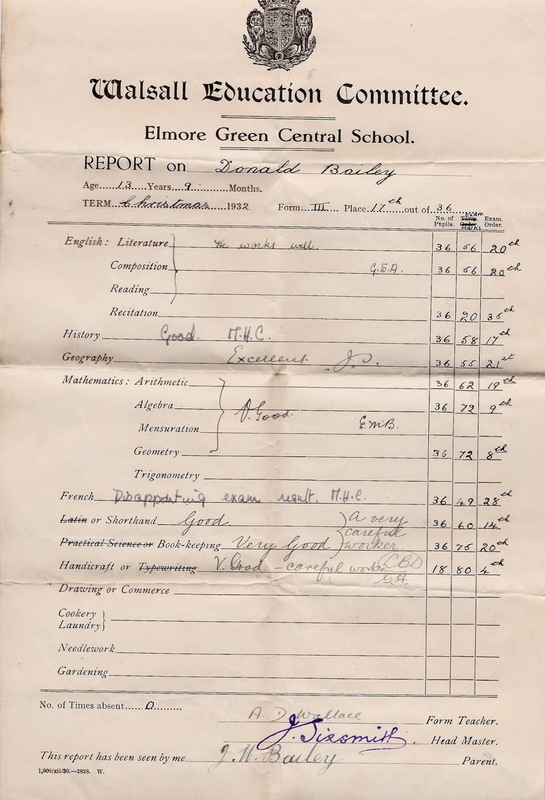 By 1932 he was attending Elmore Green Central School on Elmore Row, Bloxwich, Walsall, in what looks like a class of 36 pupils in this report card. 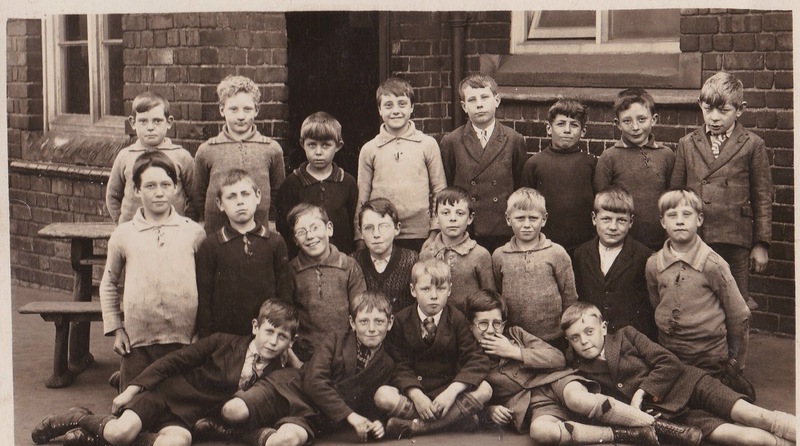 After leaving school he was working as a tool setter but 1936 was the year of the Jarrow March and high unemployment, particularly in the local coal mining industry. He made other plans. 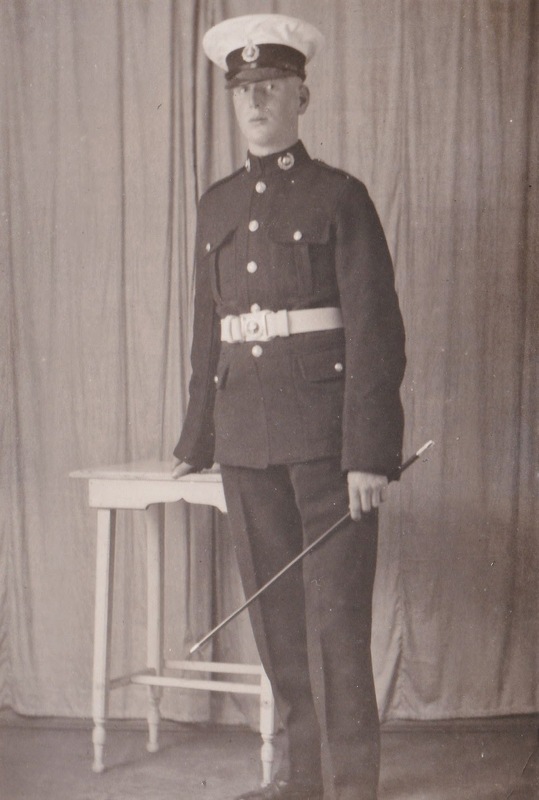 No sooner had he turned 17 on the 18th of March 1936 than he had applied to join the Royal Marines. 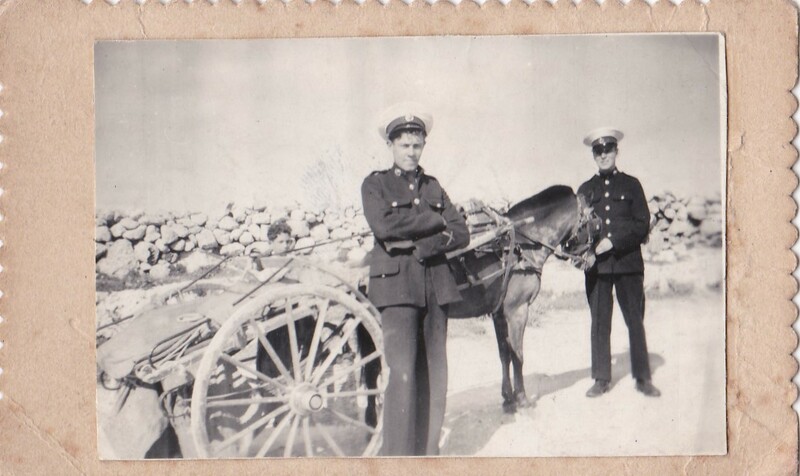 On the back of this photo my gran had written at some time in the past "R. D. Bailey March 1936, aged 17". 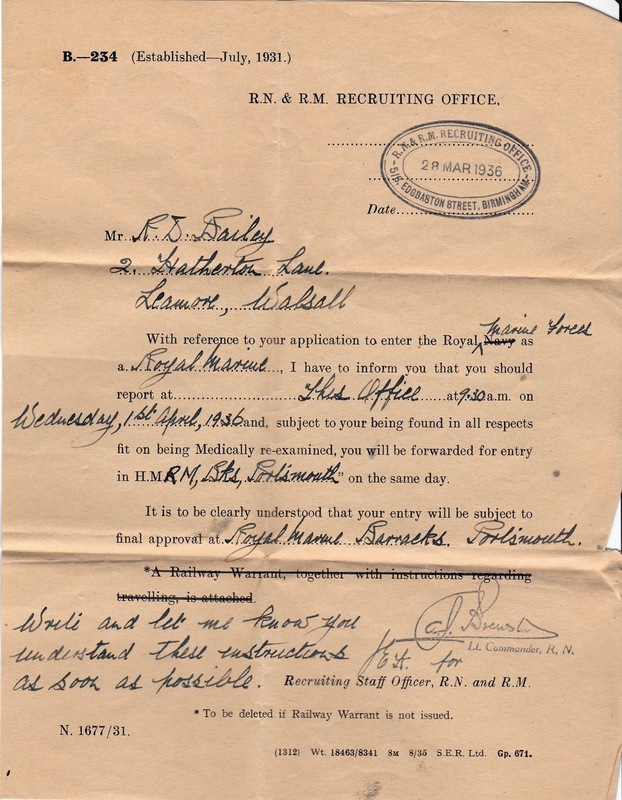 On the 28th of March 1936 he was sent this reply from the Royal Marines recruiting office in Birmingham. It told him to report there 3 days later for a medical examination and if deemed fit he would be straight off to the Royal Marine Barracks in Portsmouth . From the form below you can see that only seven days after his 17th birthday he signed up to the Marines for 13 years. At the bottom of the form you can see that he signs to "be faithful and bear true allegiance to His Majesty, King George the Fifth". I quite like the fact that instead of re-printing the application forms the king's name has been scored out and "Edward the VIII" draw in red pen alongside. The new king was nine weeks into his ten month reign so I am sure that they got around to running off some new forms in time for his abdication in December 1936. Also this form states that, if he wishes to, he can pay the crown £20 anytime within the next three months and be discharged from the Marines. 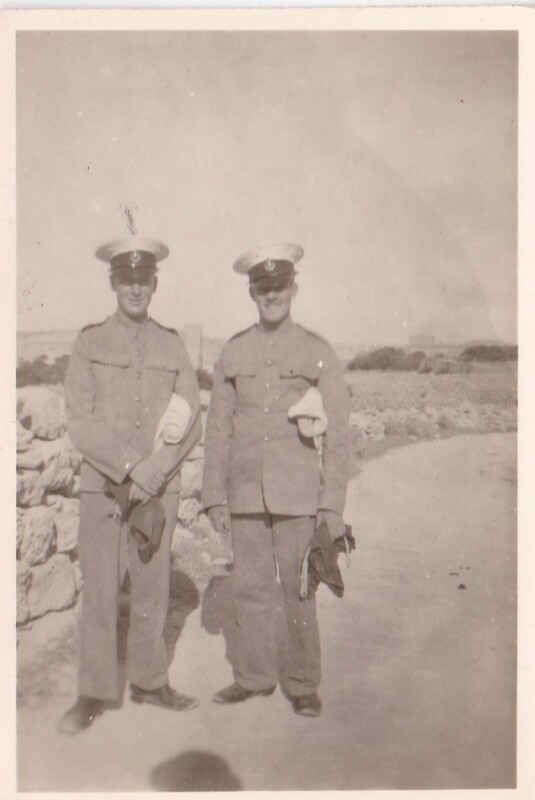 In these two photographs Donald is wearing the uniform of the Royal Marines. 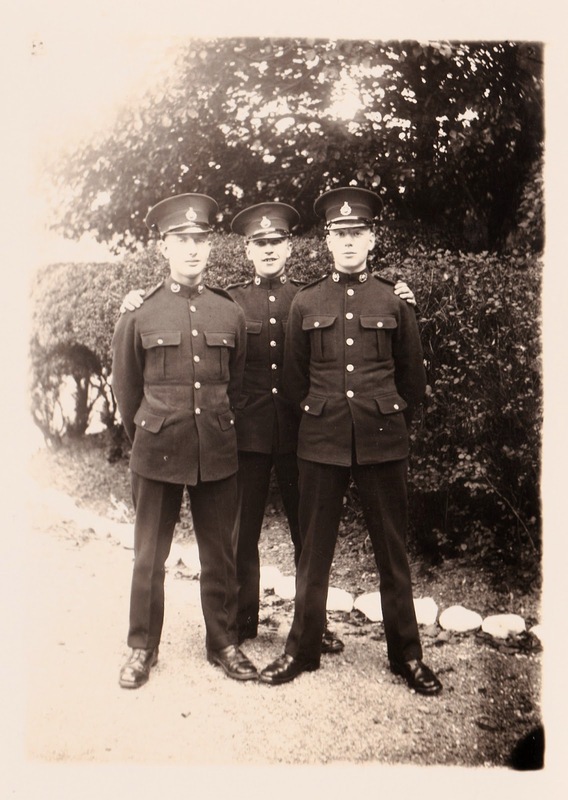 In the first picture he is standing on the right alongside two colleagues and the studio picture was sent home by the 17 year old Donald to his dad and sister. Sadly there are no letters or postcards home still surviving to tell us how he got on or what he thought of his life at sea. 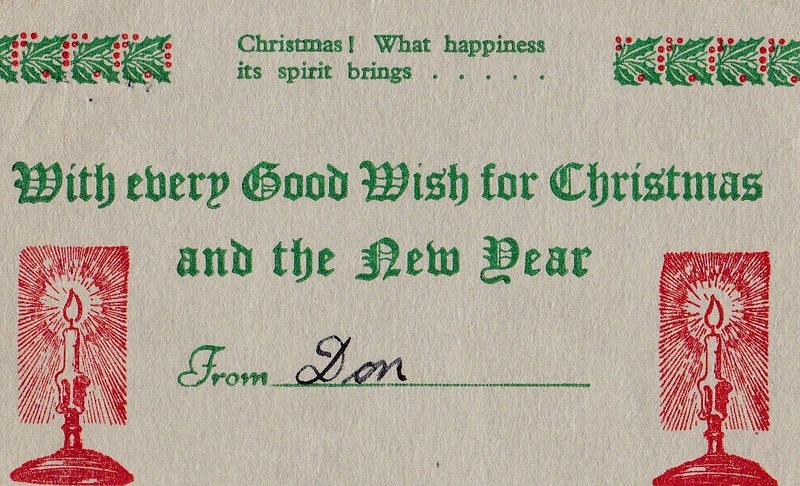 The only other item I have from Donald himself is an undated Christmas greeting to his family. During the war Donald served on HMS Glorious. HMS Glorious was a battlecruiser built for World War I and rebuilt as an aircraft carrier at Rosyth and Devonport in 1924. 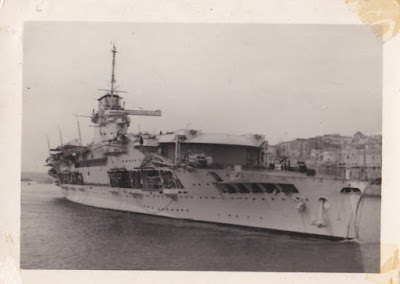 After briefly serving in the Mediterranean she passed through the Suez canal where the ship took part in the unsuccessful hunt for the Admiral Graf Spee. By April 1940 she had rejoined the Home Fleet to provide air support for British forces in the Norwegian campaign. 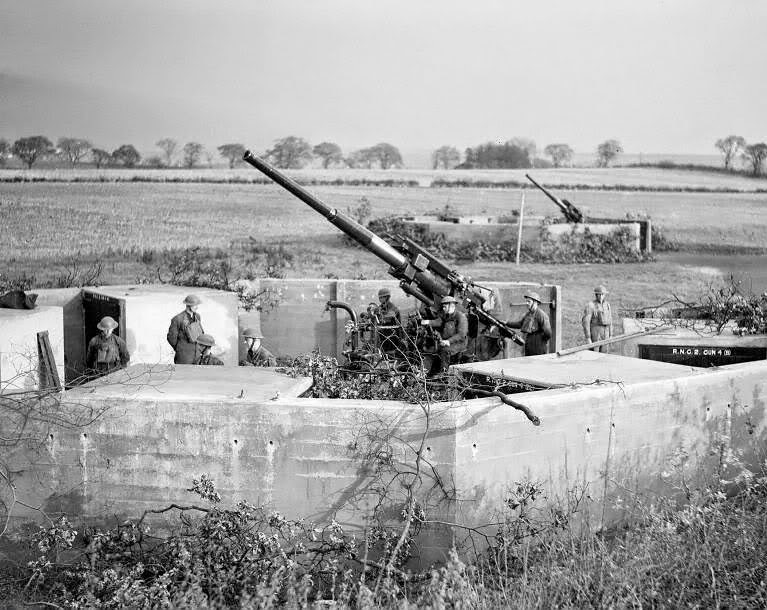 When Germany invaded France in May 1940 the British Expeditionary Forces had to be withdrawn and after 62 days of fighting Germany captured Norway on 10th of June 1940. HMS Glorious made trips between Norway and Scapa Flow supplying aircraft for the campaign but when she arrived off Norway on the 2nd of June 1940 it was to support the British evacuation. British Gladiator and Hurricane planes were flown on board. The captain of HMS Glorious, Captain Guy D'Oyly-Hughes, is reported to have frequently come into dispute with the professional aviators under his command and to have often rejected their advice. 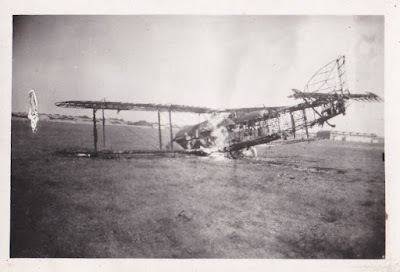 On the 8th of June he made a request to set off independently to Scapa Flow instead of travelling with the fleet, to hold a court-martial of his Air Commander. The ship was accompanied by the destroyers Acasta and Ardent. In conditions of maximal visibility as it was that day it would be normal practice to have spotter planes in the air on combat air patrol, but this was not the case, and when the German battleships Scharnhorst and Gneisenau spotted the funnel smoke of the three ships and attacked there were no aircraft on the flight deck ready for quick take off and no look out in the crow's nest. The authoritative Jane's Naval History of World War II reports that HMS Glorious was "proceeding independently for no good reason". Two hours and thirty-five minutes after the Germans had spotted the British ships all three had been sunk. Again, from Jane's Naval History of World War II, "It is possible that, had she been following correct procedures, she could have greatly discomfitted the prowling Scharnhorst and Gneisenau. In the event she was sunk with heavy loss of life." 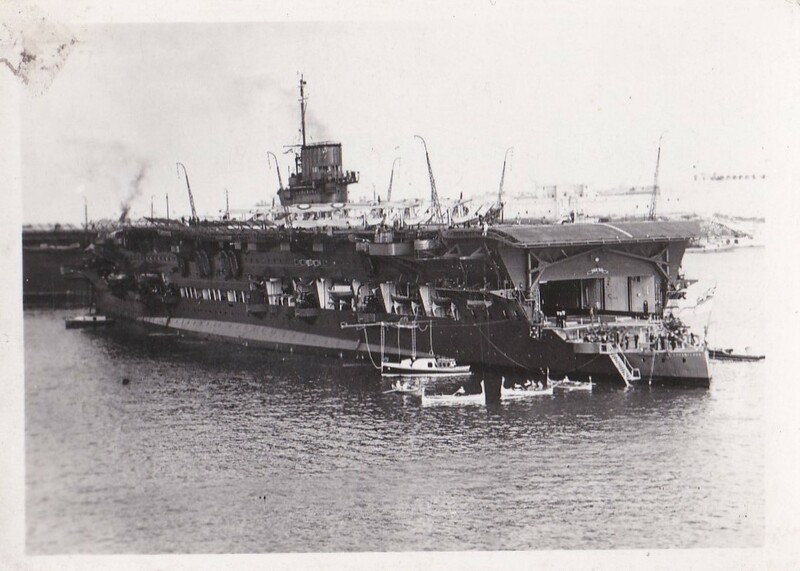 Survivors have estimated that about 900 men abandoned HMS Glorious, but the Germans made no attempt to rescue the men in the water. No British ships came to the aid of the men either, despite HMS Devonshire being 30-50 miles away. It appears that HMS Devonshire was the only ship which received the transmission from HMS Glorious that she was under enemy fire. As HMS Devonshire did not rebroadcast this enemy sighting no other ships were informed. HMS Devonshire had been ordered to maintain radio silence and proceed to Britain at full speed as she was evacuating the Norwegian royal family and government to London. Therefore no effective rescue was launched by the British Navy. Over the next five days several survivors were found by two Norwegian ships and by a German seaplane. In total there were only thirty eight survivors from HMS Glorious and one seaman each from the Acasta and the Ardent survived. Although I only know the story of Rodger Donald Bailey, 1,518 other men lost their lives that day. 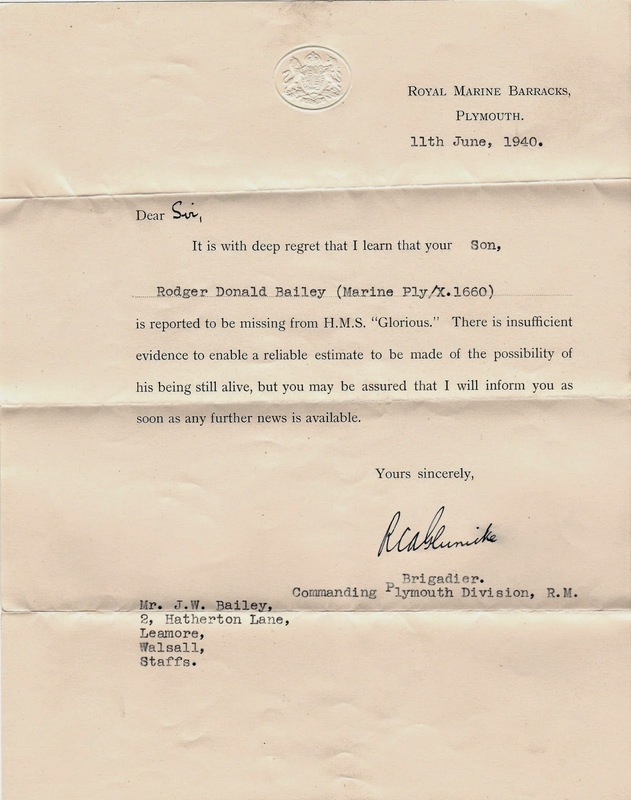 Out of the blue on the 11th of June 1940 Donald's father receives a telegram from the Marines in Plymouth. It says "Deeply regret to inform you your son Marine R. D. Bailey is missing, possible a prisoner of war." 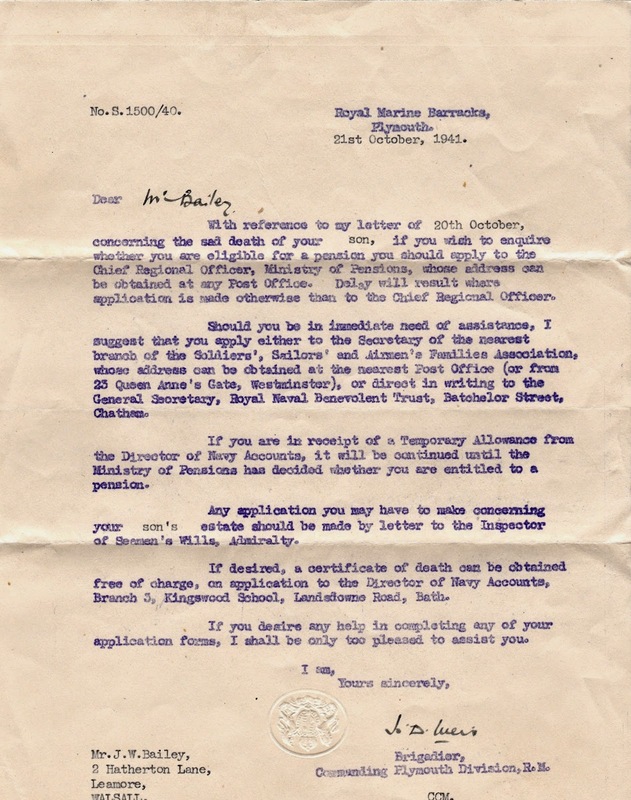 The same day, 11th June 1940, a letter is posted from the Royal Marine Barracks in Plymouth. It says "there is insufficient evidence to enable a reliable estimate to be made of the possibility of his being still alive, but you may be assured that I will inform you as soon as any further news is available." 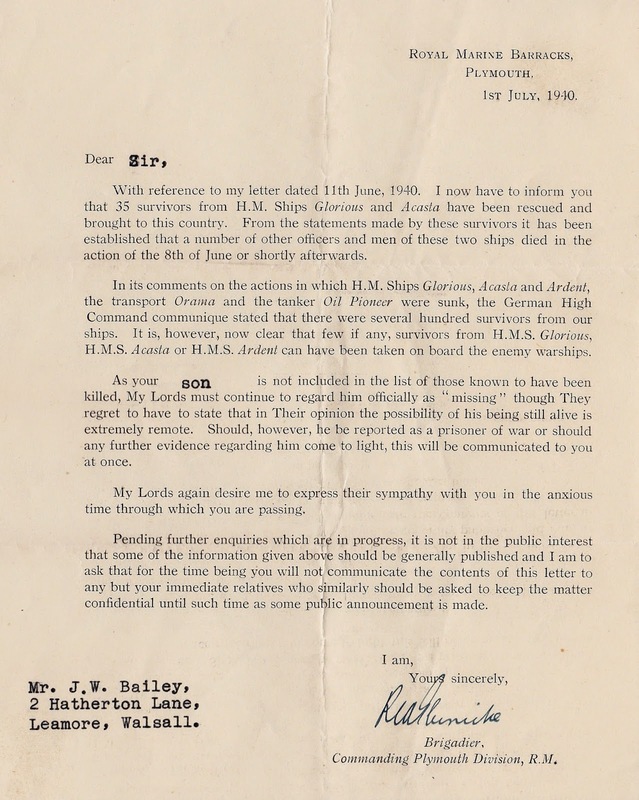 Two weeks later the next letter is posted from Plymouth on 1st July 1940. It reports that 35 survivors have been brought to Britain and their reports confirm many deaths. 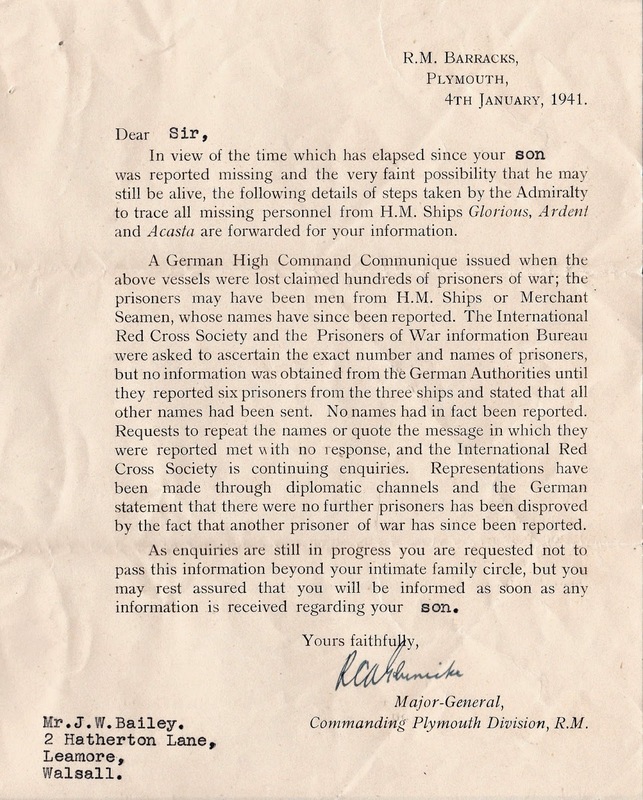 "In its comments...the German High Command communique stated that there were several hundred survivors from our ships. It is, however, now clear that few if any survivors...can have been taken on board the enemy warships." This news is bad for Donald's father and sister in Walsall, but surely leaves his family clinging to the hope that Donald is now a German prisoner of war. 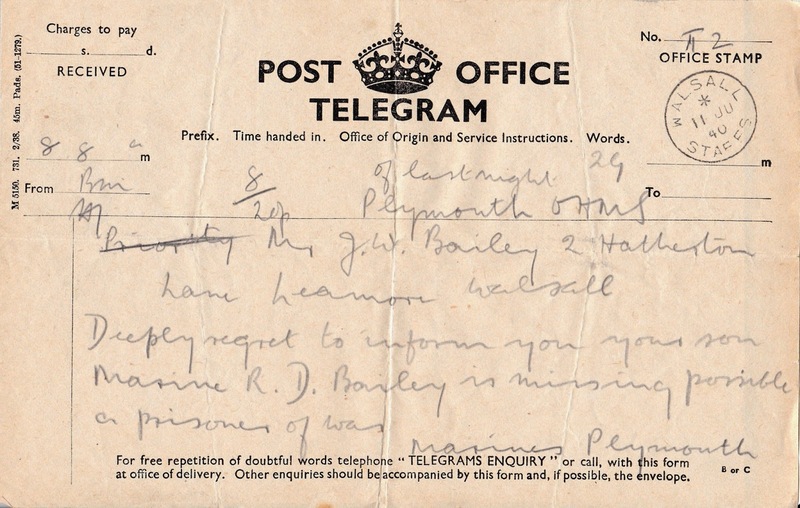 My gran has no other letters which the family received until 4th January 1941, seven months after the sinking. It is an update of efforts taken by the Marines to ascertain the fate of the men remaining missing. 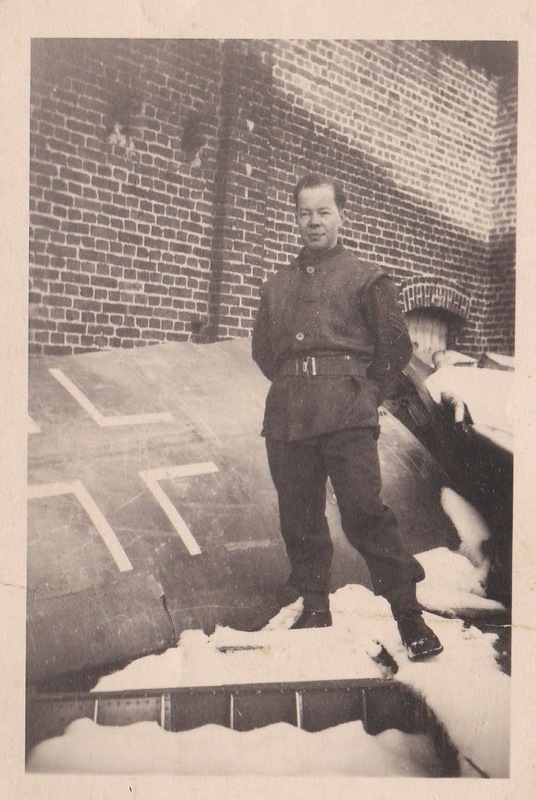 It again recounts German claims of hundreds of prisoners of war and steps taken by the International Red Cross to find out who these men are. 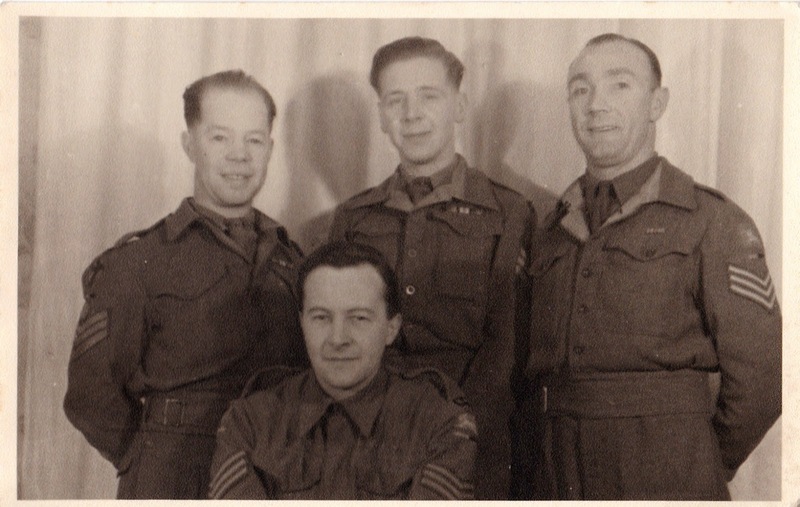 Even if the "hundreds" of prisoners now looks in doubt, Donald's family are being told that there are six men from the British ships being held. Again it must only be a normal reaction for the family getting this letter to hope that Donald is amongst the six. Finally on 20th October 1941, over 16 months since the sinking of HMS Glorious, the Admiralty confirm that they believe Donald and all the other missing men from the ships, have died. We are still six weeks away from the bombing of Pearl Harbour and America's entry into the war. They report in this letter that the International Red Cross and the American embassy in Berlin had been helping with their enquiries but there is no longer any hope that Donald is alive. "The long continued suspense and anxiety which you have had to endure is deeply regretted..." and for me, hard to imagine. 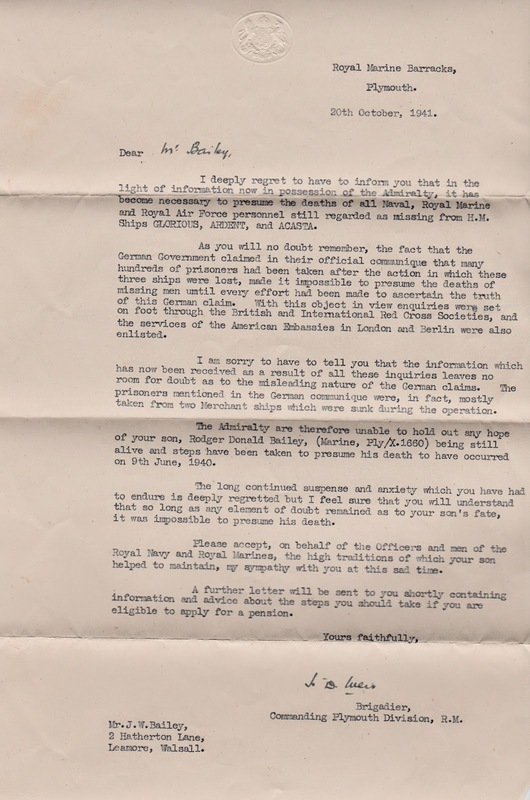 A letter the following day, 21st October 1941 confirms the formalities of discussing any possible estate of Donald and pension for the family. In the space of 24 hours any lingering hope that Donald's father Joshua or his sister, my gran, may have clung on to, is extinguished. Donald was 21 years old when he died. 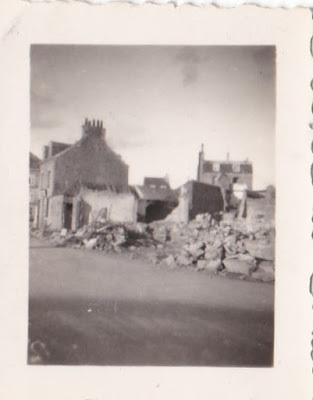 In 1941 my granny was 16 years old and still living with her father and step-mother in Leamore, Walsall. Her response to the loss of her brother is to go to an army recruiting office, lie about her age and sign up. She told me that her dad scolded her for this. He said that he had already lost one of his children to the war and didn't want to lose his other, but her mind was made up. She spends the next 4 years operating anti-aircraft guns in Bristol and Whitby. 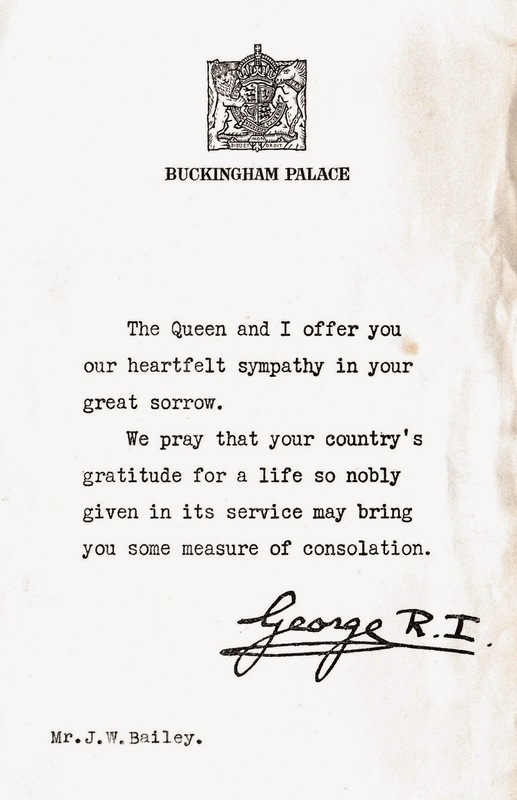 On 5th November 1941 Joshua receives a letter from Buckingham Palace offering the condolences of the king and queen for his loss. Like all of these other letters first Joshua and then my gran holds onto it and keeps it with the few photos they have of Donald and with his school report cards. 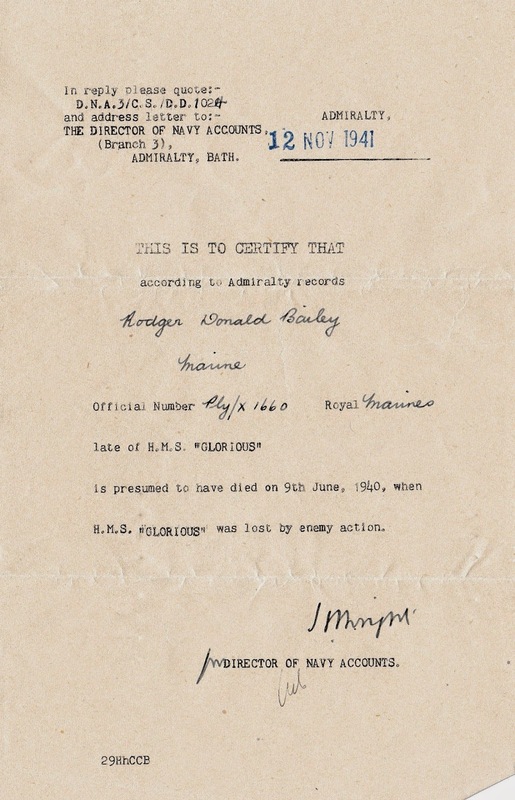 A few days later they receive official confirmation from the Admirality of Rodger Donald Bailey's death "when HMS Glorious was lost by enemy action". 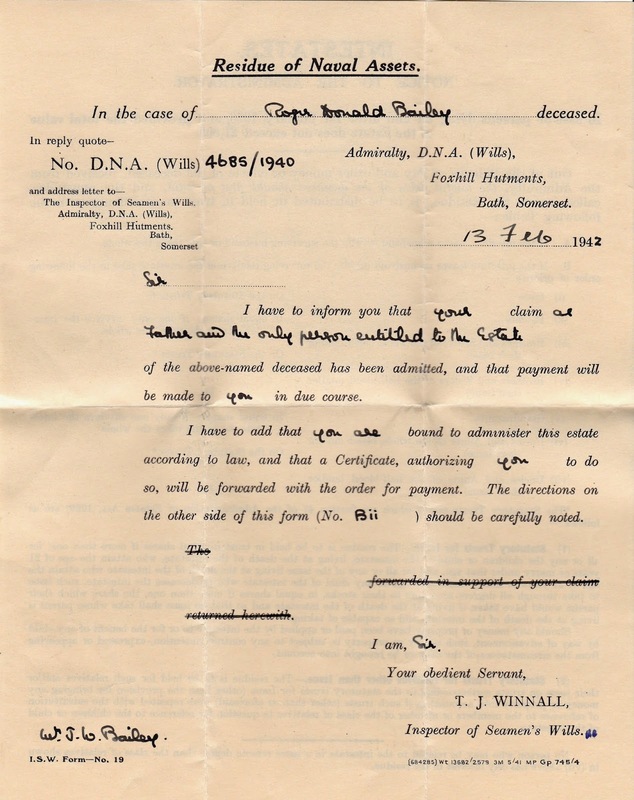 Four months later in February 1942 a letter comes confirming that Donald's family will receive his estate, £13 11s 5d. 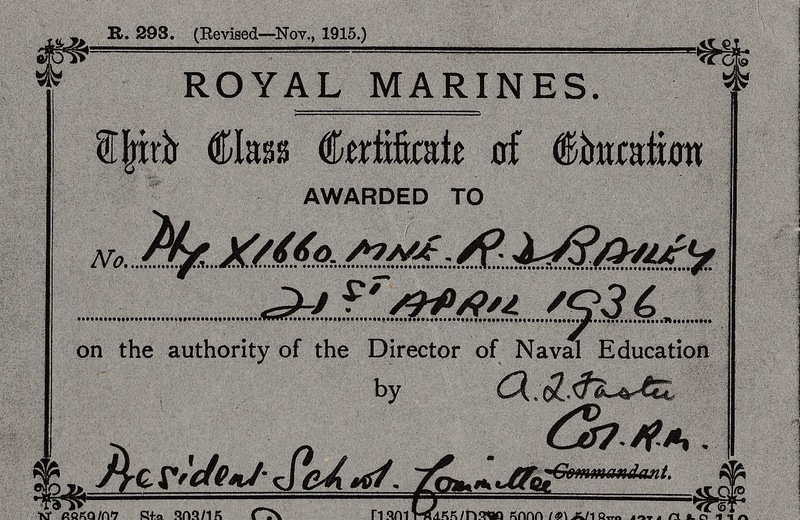 This is a good bit short of the £20 he would have needed to pull together to buy himself out of the Marines in 1936. After the war has ended thoughts turn to remembrance. 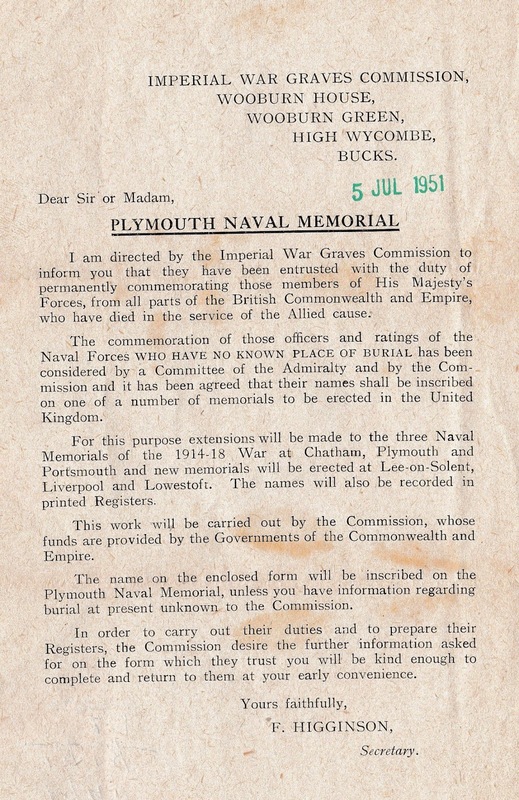 In 1951 the Imperial War Graves Commission contact Donald's father to advise him that his name will be recorded on the Plymouth Naval Memorial. 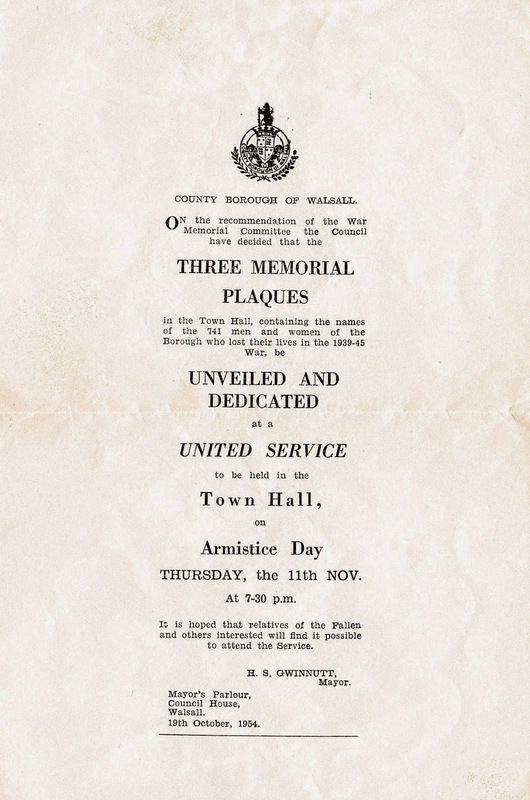 Donald's father is 63 years old in 1954 when he is invited to attend the unveiling of a plaque on Armistice Day in Walsall dedicated to the memory of the 741 men and women of the borough who lost their lives in the war. So my gran's response to this was to leave home at 16 years of age and enlist in the army. 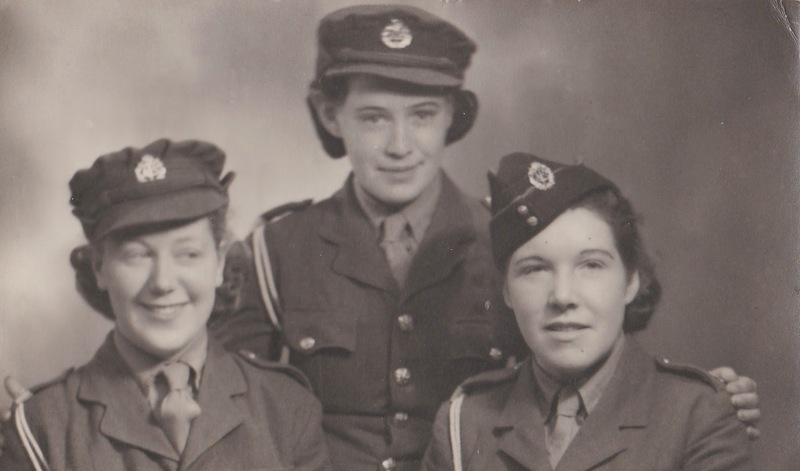 She volunteered to be sent abroad but instead was trained to work the radar for the anti-aircraft guns. 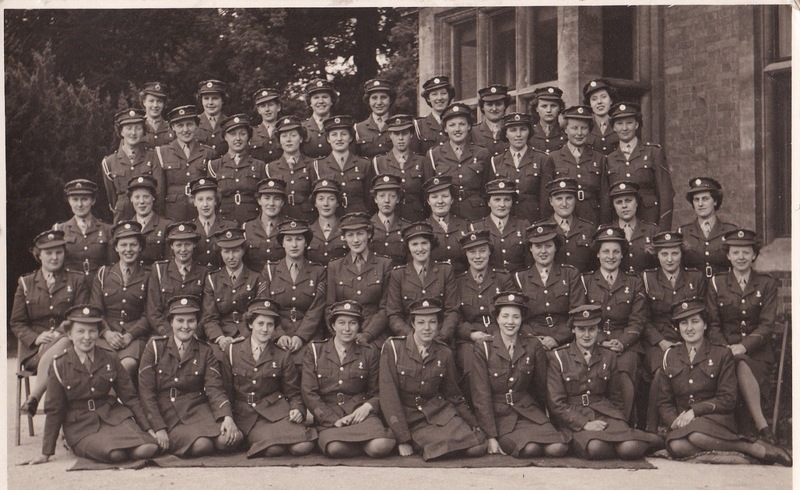 In this photograph below she is with her colleagues in the Auxiliary Territorial Service (fourth from the left in the second back row). She has held onto her uniform badges and let my son see them for a school project he was doing recently. She spent almost 4 years outside Bristol, at Portishead, at the anti-aircraft guns there. When working on the anti-aircraft radar she says that she would work beside the predictors who would calculate where the aircraft were and pass on the message when to fire. It had been decided by Churchill that women were not to be put in the position of actually pulling the trigger but could undertake all other roles. During the day they were given other jobs, sometimes peeling potatoes or helping farmers mow their hay or bring in grass. Her favourite job was to take the laundry from the camp into Bristol as it was a trip into town. 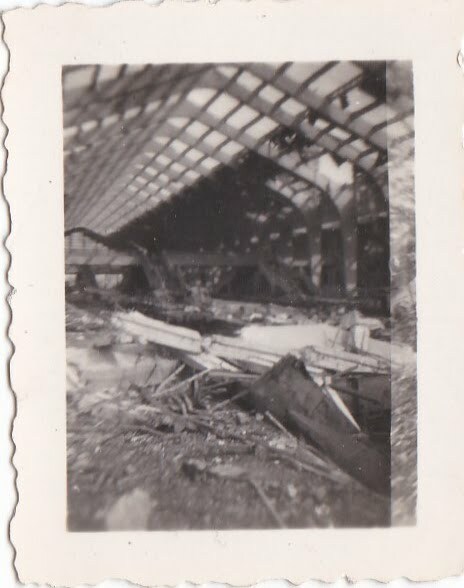 Even when recalling the shrapnel hitting the building where she slept at night she remembers it all being a lot of fun and when she was discharged from the ATS at the end of the war she re-enlisted to join the NAAFI (Navy Army Air Force Institute). 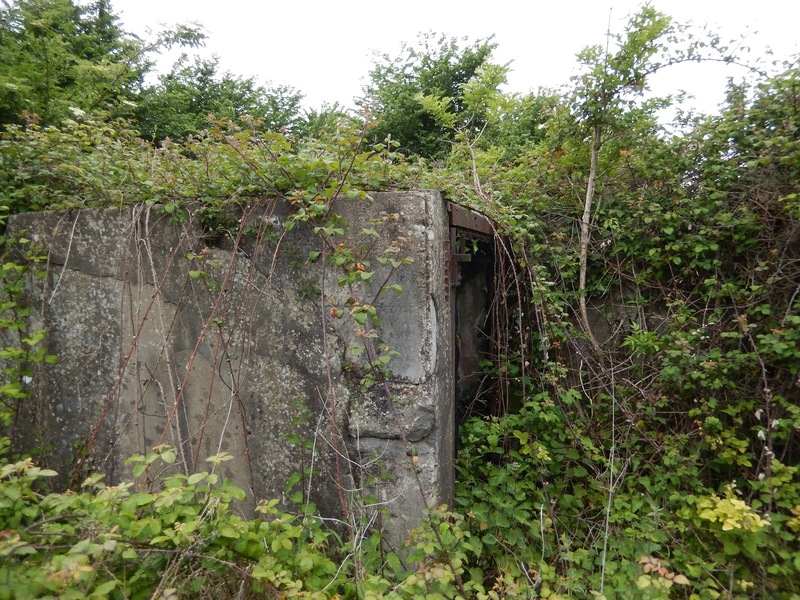 In May 2015 my parents visited Portishead as the remnants of the anti-aircraft gun positions are still standing, although now overgrown with weeds. 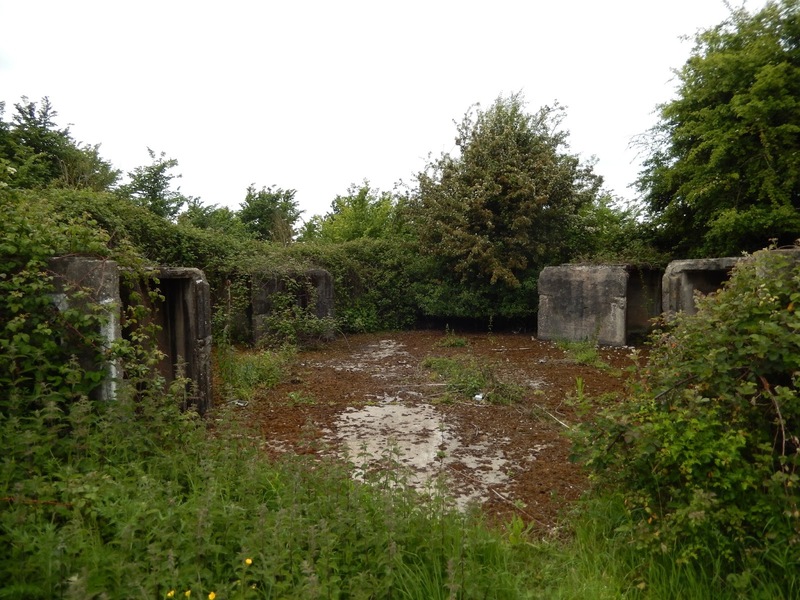 A quick jump over a barbed wire fence and my dad was able to see where my granny spent her war years, at the Bristol B2, Heavy Anti-Aircraft Battery 237. 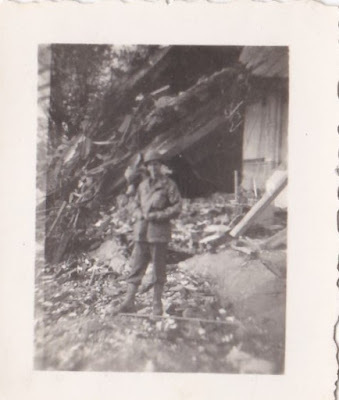 Whilst in the NAAFI my granny met a soldier from Scotland, my grandad. He was from Glasgow, living in the shadow of the Harland and Wolff shipyard in Govan where his father worked. 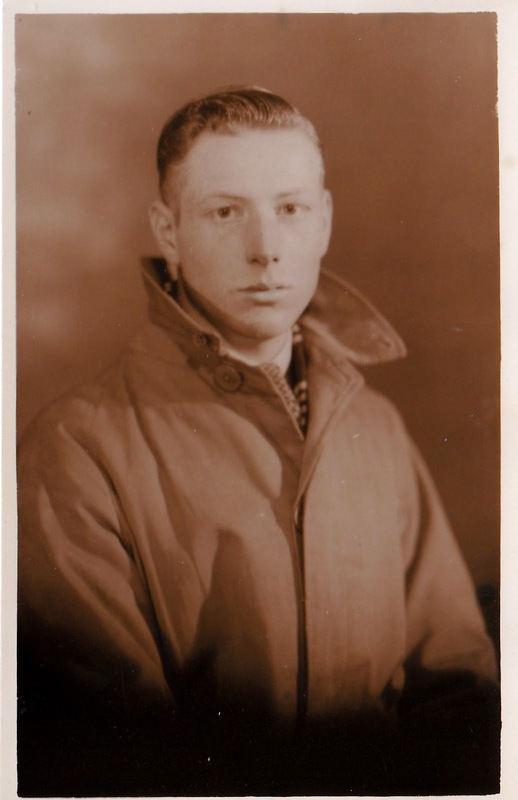 He had enlisted in June 1940 and was trained as a radio operator and mechanic. In this role he crossed at Normandy into France and then up through Belgium, eventually crossing into Germany at the end of the war. 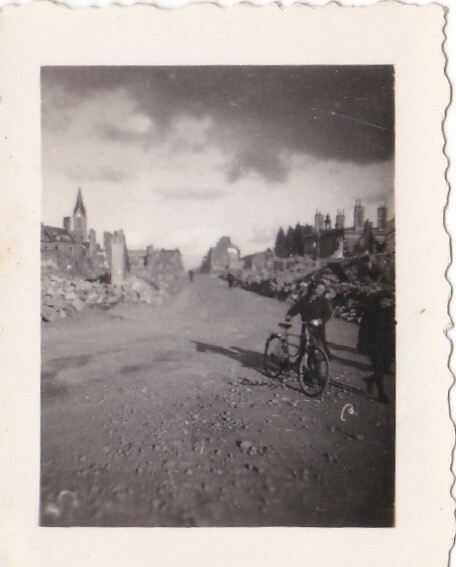 When he left the army he proposed to my gran and brought her back to Glasgow, where she has stayed ever since. As stated above the names of the men lost from the Acasta, Ardent and HMS Glorious have been remembered at the Plymouth Naval War Memorial and also usually in their home towns. In St Nicholas Church at the Naval base in Devonport the Glorious, Ardent and Acasta Association unveiled a plaque in 2001 in memory of the dead. Since then other memorials have been unveiled and in 2010 on the 70th anniversary of the sinking a plaque was laid at Harstad in northern Norway. In Cumbria lies St Peters Church at Martindale in the heart of the Lake District. In this church there are memorial stained glass windows to St Nicholas, the patron saint of sailors. These windows are dedicated to the memory to the men of HMS Glorious and represent a bird's eye view of the aircraft carrier in full steam. My gran was unaware of any of these memorials until I found out about them recently and once I told her about them she was keen to visit. This year my parents took her and her partner Bert for a day trip down to the church in the Lake District. They left a verse Bert had written and my gran left a ceramic posy. She was pleased and surprised to see that other people had visited too. 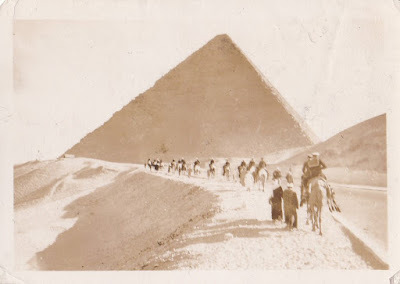 She wrote to me "Other people had been to pay their respects also... It is wonderful to think that someone else had thought about them too." She said "We had a lovely day there. 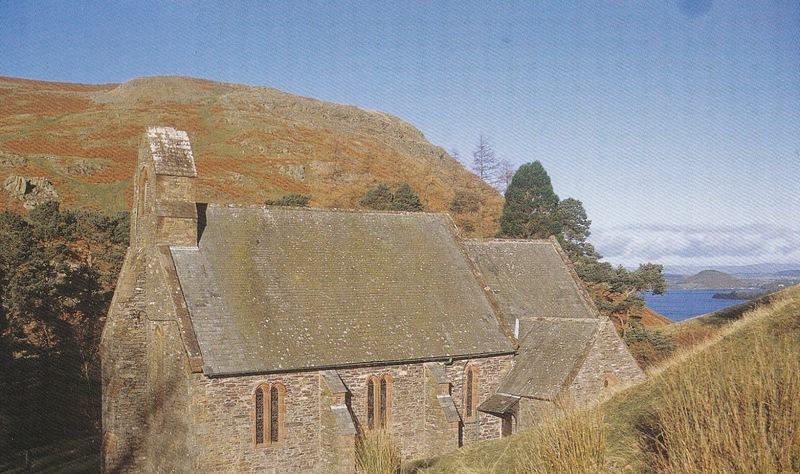 The church is old and solid and set amongst the hills." My gran is 90 years old now and still very fit and active. In December 2014 she celebrated her birthday with some of her family and seven great-grandchildren. Memorials are there to help us remember those who died in war and not to glorify war. We remember Donald, my great uncle, my dad's uncle, my gran's brother, who didn't get the chance to see his own family grow up. As mentioned above, I have discovered some more photographs that my granny has held onto. 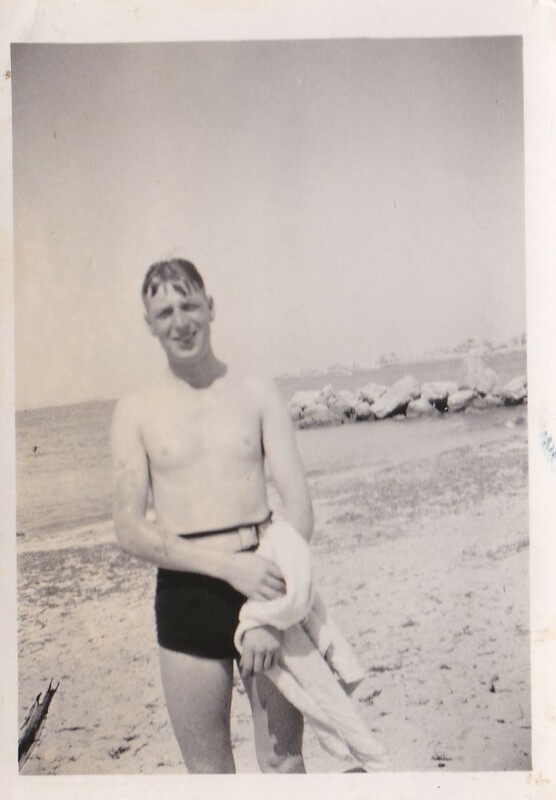 Most of these were taken by her brother Donald, and sent back to her from Malta and Egypt when he was serving on HMS Glorious. There are also some newspaper clippings referring to the sinking which she has held onto. Where Donald has added some comments on the back of the photographs, these are copied below. 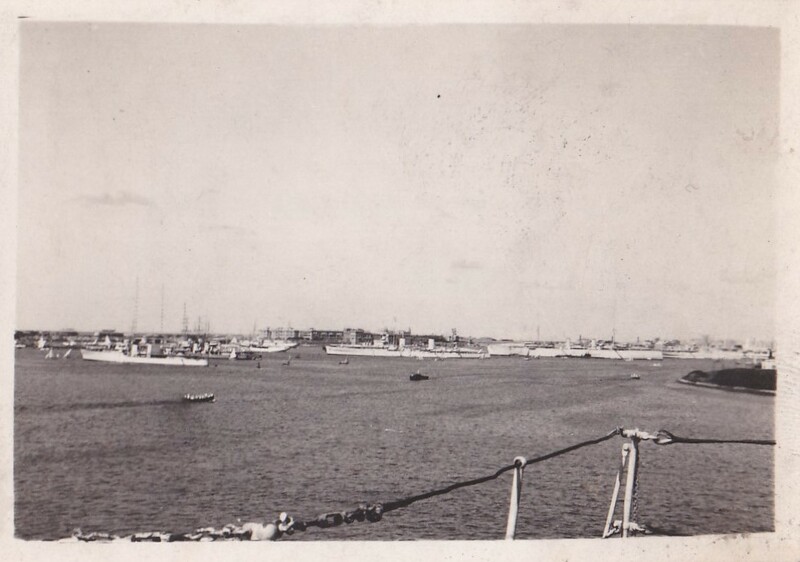 "On the left, Malta 1939, just coming from a swim, Hal Far"
"our sister ship, HMS Courageous"
"Alexandria Harbour, a view I took from the ship"
I also include here four photographs that belonged to my granddad. These photographs are tiny, about the size of postage stamps, and are expanded here. They show the damage that he encountered as they made their way through Normandy after D-day. "wrecked Jerry garrison at Lison (Normandy) with Wayne"
Apologies for any inaccuracies in the above and please add a comment if you wish me to make any corrections or clarifications. My comment went on twice sorry... I can't see a "Follow" button to keep updated, do you know how to do this? (There used to be a "Follow" button!!! Hello, Thank you for your Blog. 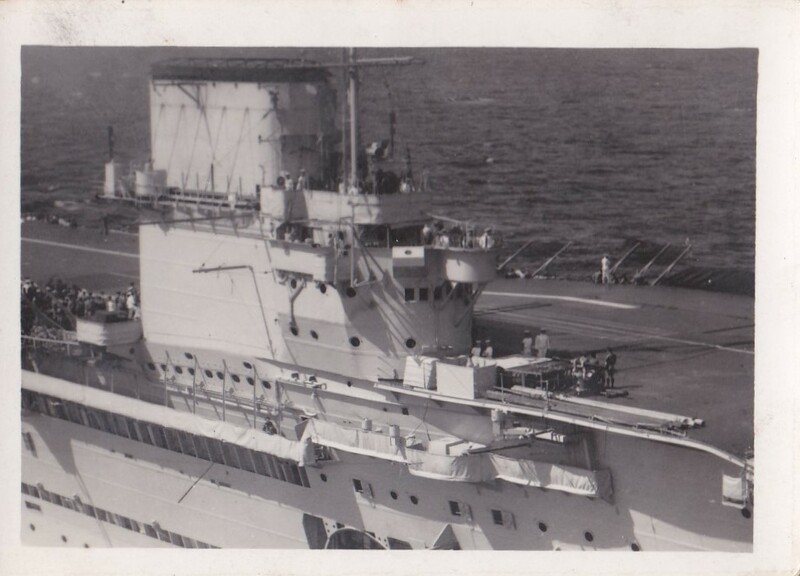 My Grandfather Reginald George Burrows was also on board HMS glorious on that fateful day. This year for my 60th birthday we went to Harstad Norway and laid a wreath at the memorial. I couldn't believe how emotional I felt being there. My Mum who will be 83 tomorrow still has a letter and Christmas card from her dad and recently applied and recived through GLARAC to obtain Reginald Arctic Star and Medal. We took these along with a copy of Reg's other medals and laid them on the memorial whilst we held a private ceremony. An experience not to be forgotten. 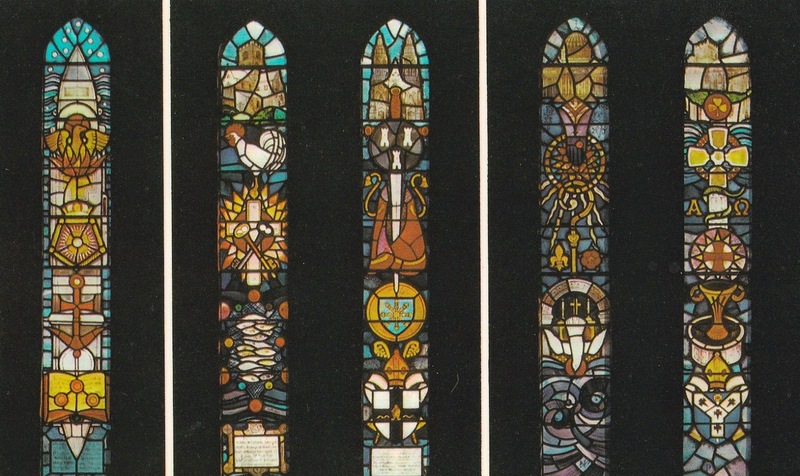 PS, We have also been to the Southsea Memorial in Portsmouth and there is also a stained glass window in the Bearsted Church near Maidstone Kent. 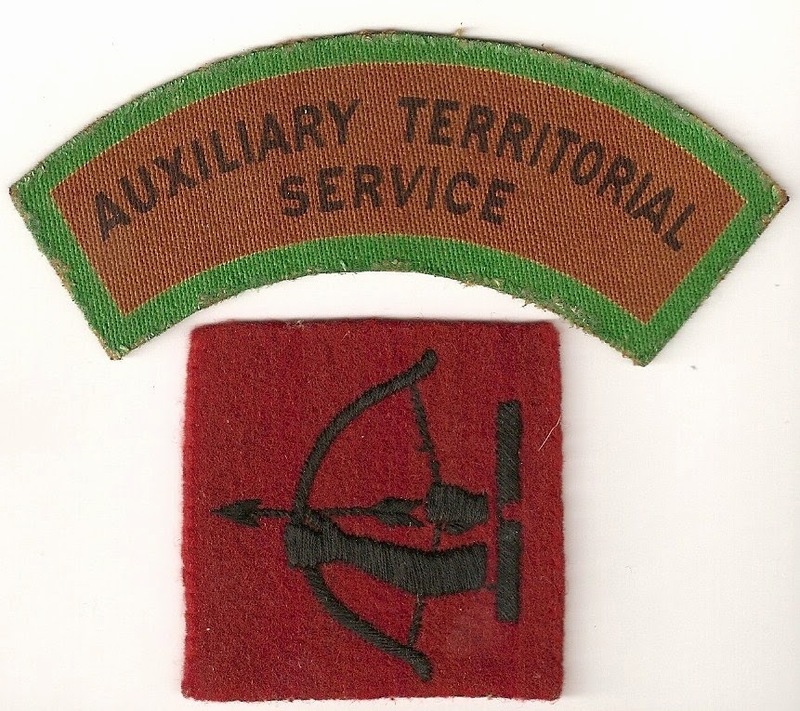 My Nan Sarah Burrows was also in the ATS and served in London and Yorkshire but not sure where. Hello and Thank you for posting this. My great uncle Salvino Zarb-Mangion (Maltese) was on the Glorious when it went down and my grandmother always missed him so very much. Thank you for sharing your memories. Thank you for sharing your story.My wife's uncle,Francis Polidano(Maltese) was only twenty when HMS.Glorious went down.Here in Malta we hold an annual service commemorating the large number of Maltese ratings who died on the Glorious as well as all those who lost their lives on the three ships.